Billing types are system configurable billing types which you can defineBilling Types setup allow system administrator to create own billing types. OfficeTimer provide few pre-defined billing types which can be rename or edited according to organization needs. There are two types of billing category which you can setup using billing type setup. Enter new billing type in “Billing Type” form which you want to add. Select billing category (select Employee if you are defining billing type of employee billing. 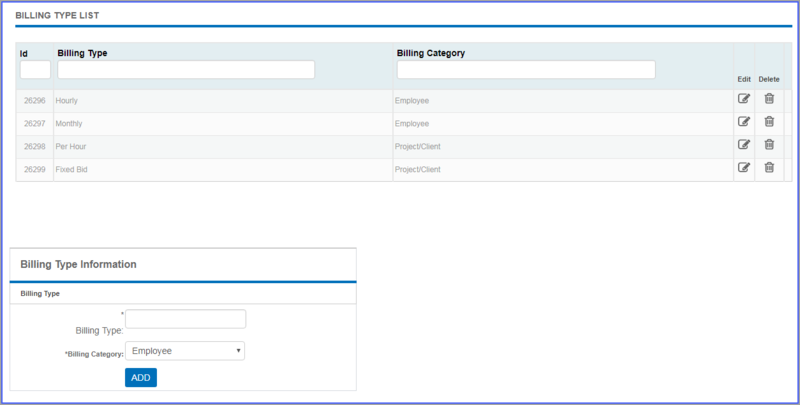 Select Project/Client if you want to add billing type for project. Click on[Add]to add this billing in OfficeTimer system. In[Billing type List], click on[Delete]link of record which you want to delete. In [Billing Type List], click on[Edit]link of record which you want to modify.